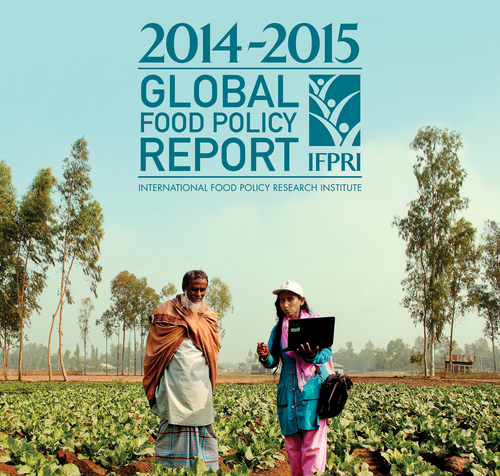 Past, present and future: IFPRI’s 2014-2015 Global Food Policy Report – One Billion Hungry: Can We Feed the World? 2014 being the UN International Year of Family Farming, the report looks to the role of small family farmers in meeting a country’s agriculture needs as well as how such farmers can become more profitable or when they might need to leave farming for a more economically justifiable pursuit. Agriculture is mainly a family affair with family farms producing some 80% of the world’s food. As such family farmers play a significant role in global food security and nutrition in both providing the food we eat but also because many small-scale farmers are themselves food insecure. Small family farms face many difficulties in producing enough food for themselves and others – declining farm size and land conflict, climate change, food price volatility and access to markets to name a few. IFPRI’s report discusses how in the face of such challenges, those farmers who have the potential to develop profitable farms can be helped to become more productive while those farmers without this potential can be assisted in exiting agriculture for other work opportunities. “Public policy should support small family farms in either moving up to commercially oriented and profitable farming systems or moving out of agriculture to seek nonfarm employment opportunities.” IFPRI, in helping those farmers with profit potential, suggest the following courses of action: promoting land rights and efficient land markets; Enhancing risk-management, mitigation and adaptation strategies such as index-based insurance; Supporting efficient and inclusive food value chains; Closing gender gaps and developing young farmers; and Scaling up productive cross-sector social safety nets, for example Ethiopia’s Productive Safety Net Programme (PSNP), Other Food Security Programme (OFSP) and Household Assets Building Programme (HABP). IFPRI recommend this course of action to break the cycle of low productivity, poverty and food insecurity that is common in small-scale farms in developing countries but the moving up or out strategy seems to leave little room for individual choice and assumes everyone must follow a market-driven, essentially capitalist approach. Many would disagree with this and IFPRI’s certainty in their conclusions is surprising, particularly their structured chart for who should move up and who should move out. That said the report, as always, summarises past events and future challenges in the context of food and nutrition security well. It gives detailed recommendations around a range of issues and pushes the debate forwards. Whether all their recommendations should be wholly adopted or agreed with is up for discussion.